My Daddy, Joe Bailey Nelson, was one of the first responders. He and my sister were coming back from Kilgore when the explosion occurred. He stopped to pick up my Mother, going directly to New London. He worked for Humble Oil and my family lived in Sexton City at the time (I did not appear on the scene until 1946 at Gladewater). As you probably could guess, my Daddy never, never, never talked about that day or the days that followed. My older siblings went to school at Rocky Mount. We are not related to the Nelson (school teacher) who died in the explosion. The Humble people were a tight bunch and many of them knew each other from Navarro County. The Bonners, Callaways, and others I can't remember right now were good friends of my parents. The Callaways lived next door to my parents at Sexton City and the Bonners were friends from Navarro County. I grew up in Talco and the Cecil Griggs family was close to my parents. They had a son named Billy, who was about 8 or 9 years older than me. Are they related to you? About my stories. I do have both first hand and second hand accounts that I have documented. My sister was about five years old at the time of the explosion, but she has a very detailed and graphic recollection of that day, that night, and subsequent days. Her recollection really does match up well with the newspaper accounts (e.g., the lights that were brought in that night to help with the recovery effort, etc.). Her most vivid recollection is at the morgue in Overton, specifically the garage that was used as a morgue. She was not suppose to be there. Daddy was identifying bodies for some friends who could not do it themselves. My sister "escaped" from the car and went looking for Daddy. Her height at that age was table high. You can imagine what she saw. She did document her memories in graphic detail. Other stories are second hand (again, neither Mother or Daddy every talked about it). I hesitate making these stories public. Most of the people mentioned in my stories are now dead, but maybe some of the family is still alive. I do not want to embarrass anyone or invade anyone's privacy in this matter. What has been your experience in this matter? Most of what I have has not been part of the public record. Both my Daddy and his twin brother, Jim Nelson, who lived in Overton, did some things to help out their friends that even the family of the friends did not know about (and probably do not know about to this day). I know some of my parents friends never recovered from that day. Even though their physical lives continue, they were dead mentally and emotionally. Some literally disappeared from the community, never to come back. I will tell you that my Daddy cried emotionally that night, something he did not do. He had been helping to shore up some walls to go and recover some students (who were alive). The walls collapsed. When they finally got to the kids, they were all dead. Most who read about New London are naturally horrified about the event. What they are missing is how this affected the people around New London. 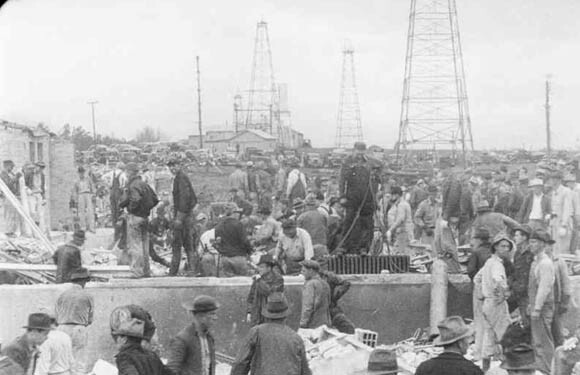 The people were so tight in the oil community (and the Navarro county connection), that even if their children were spared, they were affected deeply by the loss of life. Some of the families knew each other for years. My family knew Mollie Ward's family (Clyde Seale) forever. Here's my Mother's recollection of that day. Daddy and Grandpa went there within minutes of the blast to see about the kids. One of Momma's cousins, Maxine Beekman, whose Father was Ira Beekman (he was the Superintendent of the W. B. Hamilton Oil Company fields), and whose Mother was Leona Beekman, went to school there. They were raising some of Leona's nieces, too, one Maxine's age named Jessie and an older girl named Helen. Maxine ended up hanging and screaming on the corner of a wall that was still standing. Jessie, some place in the building, was huddled with a boy in her classroom buried, and when they finally saw some daylight and crawled toward the opening, a radiator from the floor above fell on the boys back as they were crawling and crushed him to death right beside her. They both survived. After the one got down, she went looking for the other. And vice versa. Unable to find each other they ran for home eventually, and found each other there. Aunt Leona was at the school looking for them, and later they came home and found them huddled together crying. Daddy and Grandpa worked there till the end. Momma says Daddy could barely speak about the horror of it all, and Grandpa had a blank look for a long time, and wouldn't talk about it. But they were there, when they and the other men were trying to match up body parts along one wall or fence-line to be identified. It is ironic what that blackboard said, the one that was found later and put in the museum, because oil is what they lived by in every way possible here in East Texas, yet it killed so many people. Grandpa continued in the oil fields until his health was too bad to work anymore. While they lived on the oil lease the baby of the family was killed when a flare pipe that had been replaced (but no guide wires were installed yet) fell over and crushed him to death. My Momma and Grandpa lifted the pipe and pulled him out. His name was James Delbert (Little Del) Beekman. My Daddy later became a truck driver in Houston, and was burned over 85% of his body and barely survived because the gas can he was carrying back to the shed at work exploded in his hand. Compare this picture to yours, and you will see that everything about the stance and body matches. The pictures are Grandma and Grandpa, and Daddy about that time. I hope this bit of the story helps you in some way. In addition to the above, Ms Plant has identified some of the people in the following photo (also located elsewhere on this site) in addition to generously providing photos at the bottom of this page. "Look at the far left edge where there are 3 men next to the rest of a wall, count from the left to the right, the 4th man standing alone is my Daddy. He rarely ever wore anything but khaki's. I do believe that the man standing on the wall just a little further to the right, very tall at 6'4", heavy mustache and cap, dark jacket and heavy gloves, facing the camera, is my Grandpa. My Grandpa, Clarence Leroy Beekman, was an oil field worker; he worked the W. B. Hamilton fields and the Sinclair fields. My Grandparents, and Daddy & Momma (Jewell Donald Peerson & Clara Mae Beekman-Peerson), lived there in Wright City, TX on the W. B. Hamilton oil lease."